It seems that this is unofficially Street Food Week here on Eat to Blog. Every Saturday from April through December, the intersection of Hester St and Essex St is host to the Hester Street Fair. The fair is populated by some artisan craft makers, and some flea market-type vendors, but I went for the food. I was particularly looking forward to the Guerrilla Ice Creamstand, but I was excited to see what other food might be there. 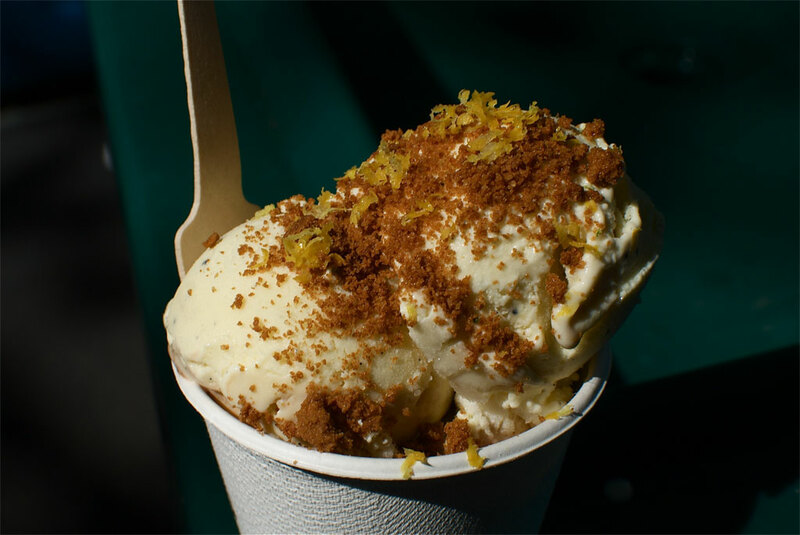 One of the reasons I was so looking forward to Guerrilla Ice Cream was that my friends over at We Heart New York raved about the Velvet Revolution, a lemon-poppy seed ice cream topped with a crumbled spice cookie and lemon zest. Unfortunately I didn’t like it very much — there was no sweetness in the ice cream. Yeah, I get that they have a stated mission of challenging “your notions of what ice cream can be,” but I think the whole thing would have been better if there was even a hint of sweetness. 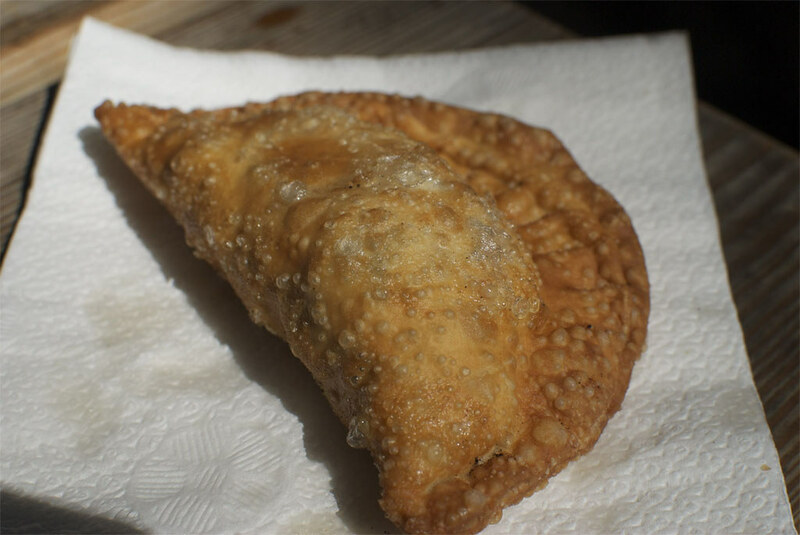 For a more savory treat I stopped by the empanada table operated by La Sonrisa and ordered a veggie empanada. 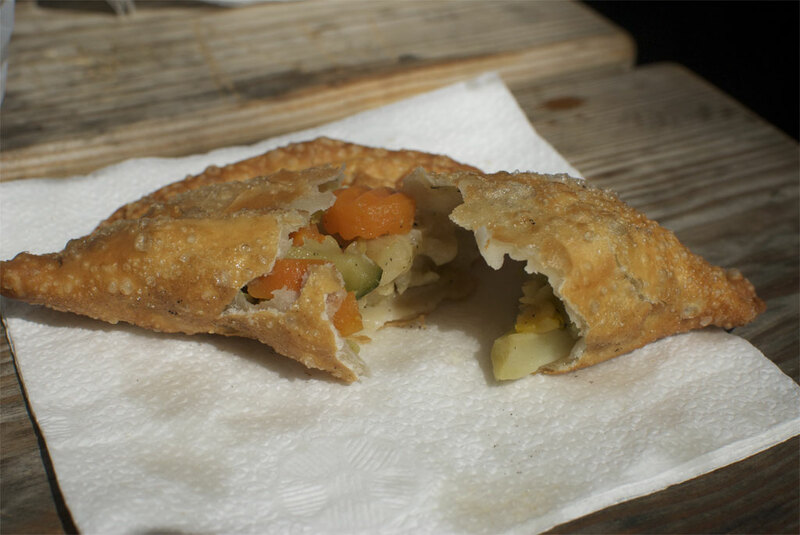 I guess most people don’t order the veggie empanada, because they had to get a frozen one from the cooler and deep fry it just for me. They were even nice enough to bring it over to where I was sitting when it was ready. It was piping hot and smelled delicious, but when I broke it open I was dismayed to see what was clearly the “frozen vegetable medley” inside. It’s a shame, because the veggies were actually very nicely seasoned, but they had the unmistakable texture of those frozen vegetables. 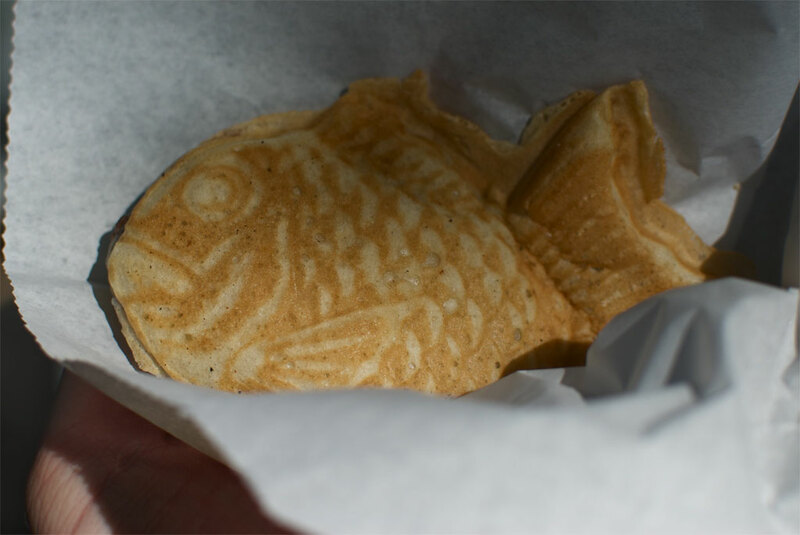 My favorite food of the day was this taiyaki, a Japanese fish-shaped cake filled with red bean paste. You can get them filled with different things (the strangest sounding, to me anyway, is sausage and cheese) and the guys at the grill make them to order. First they pour the batter into two fish shaped moulds, and as they solidify your chosen filling is piped in. Then the two fish halves are pushed together and cooked until they fuse into a whole fish. It was warm and moist and sweet, but not too sweet, and pretty much made my day. Plus the Japanese guys at the grill were super nice. 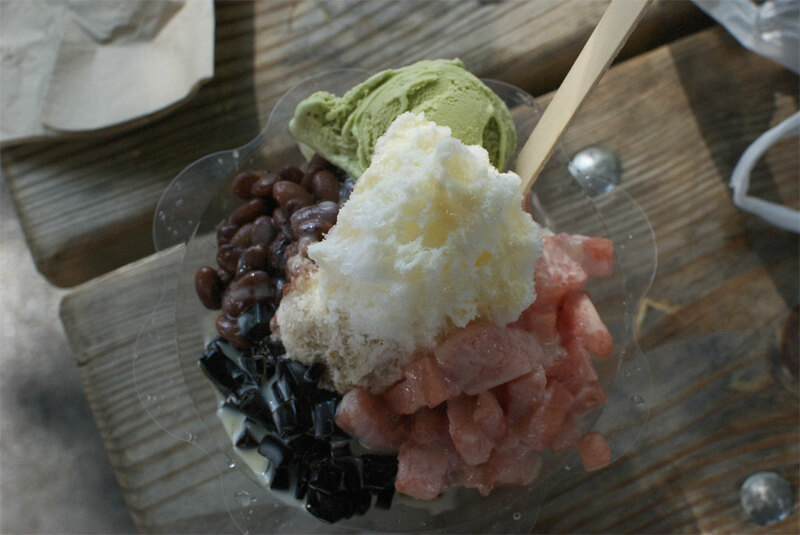 When we went to the Parked festival on Governors Island, I was disappointed that I didn’t get to sample the shaved ice dessert from Bao Bing, so I was happy to see them at the Hester St Fair. I asked for a recommendation from the woman at the table, and she asked if I wanted something lighter or something more traditional. I opted to go the traditional route, and got a shaved ice topped with watermelon, sweet red beans, grass jelly, and a scoop of green tea ice cream. How did they construct such a thing? It started with some shaved ice in the bottom of the cup, which was then topped with condensed milk. Then more shaved ice, the toppings, and more condensed milk. Although it looked like a huge mound of food (one guys saw me carrying it and said “Good luck!” to me), it disappeared fairly quickly — shaved ice has a lot of volume, but it’s just water. I liked the texture of the grass jelly (which I have tasted before, but it didn’t have much flavor. The red beans were not my favorite, both texturally and flavor-wise. The watermelon was surprisingly warm, though the green tea ice cream was nice. Yeah, I guess it’s coming across that I wasn’t thrilled with this dessert. Well by this point I had eaten way too much, and decided to cut myself off. In fact, I didn’t eat anything else for the rest of the day. 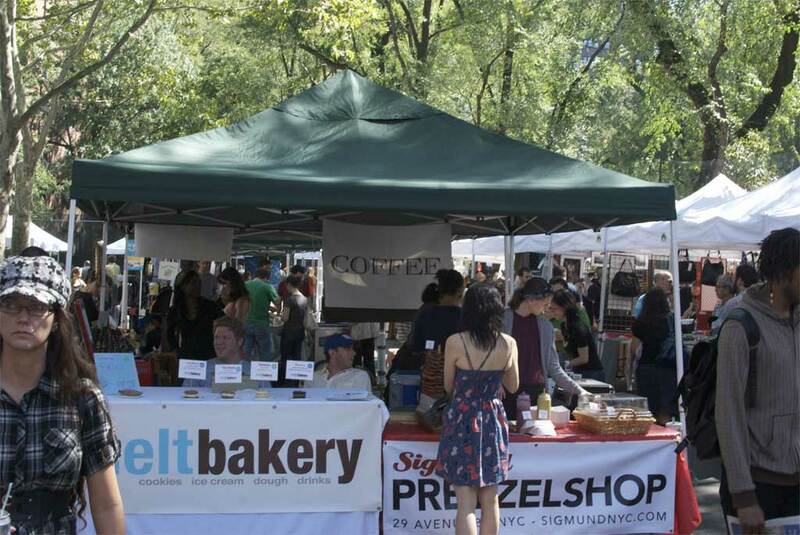 If you’re in NYC, be sure to check out the Hester St Fair this Saturday.